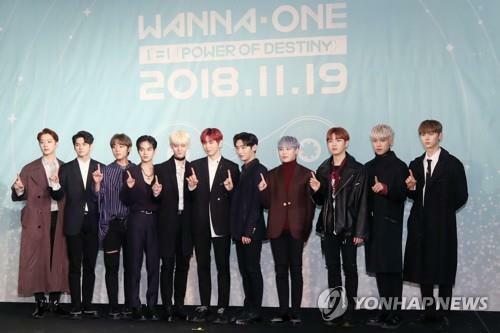 SEOUL, Nov. 20 (Yonhap) –The main track of K-pop boy band Wanna One’s first studio album has swept local music streaming charts, data showed Tuesday. The new album, “1¹¹=1 (Power of Destiny),” is the group’s first and probably last full-length album. The project boy group, comprised of 11 winners of music channel Mnet’s idol competition show “Produce 101,” started its group activities in August 2017 for a limited time, with its deadline set at the end of this year. The main track “Spring Breeze,” with the hook’s lyrics going, “Let’s meet again when spring breeze blows past,” is an alternative dance song with elements of synth-pop, guitar and dynamic percussion sounds. It is reported that their group activities might get a brief extension to earn time for year-end activities and a concert early next year.